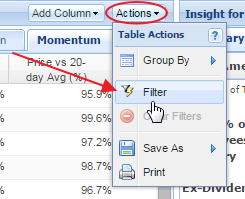 A filter will reduce the number of tickers displayed in the Table to only those that meet the filter criteria. This will bring up a window that displays all of the columns currently in the Table, shown below. 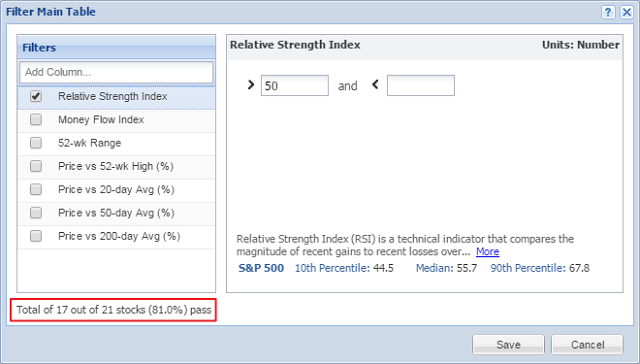 Just click on the column that you would like to filter on the left, and enter in your filter criteria on the right. 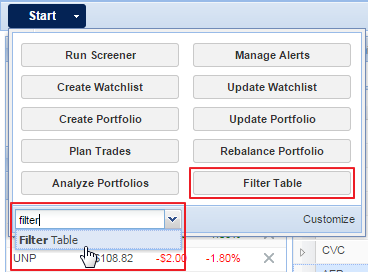 After you enter in a filter value, you can see at the bottom how many stocks from the table will pass this filter. When you have entered all of the filters you desire, click ‘Save’ and the Table will be filtered by the entered values. You can also access this filter menu through the Start menu, either by clicking the Filter Table item, or by searching at the bottom of the Start menu and selecting Filter Table from the search results. 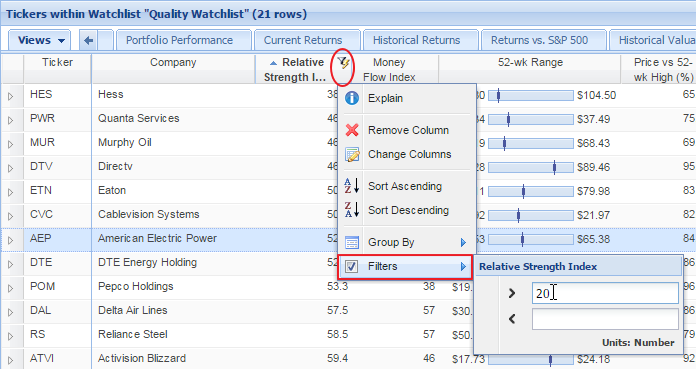 Another way to create a filter is to right-click on the column header of the column that you wish to filter, mouseover ‘Filter’ in the drop-down menu and then enter in the desired filter values. For both ways, you may either hit enter or click away from the menu to save and enact the filter. Note: Not all columns can be filtered; only those that can be filtered will have the ‘Filter’ option in their drop-down menu. If a column has a filter in place, the column header will be bolded and an icon will appear to the right of the column header which, when moused over, will show the filter criteria. The name of the filtered column will also appear in the Table’s header, outlined below. If you change Views while a filter is enabled, the column filtering remains in place. If the new View does not contain the filtered column, the column will temporarily move just to the right of the Ticker column for as long as the filter is in place.